This blog has never been terribly kind to Richmond, BC based MacDonald Dettwiler (MDA), but when the company does something right, its important to acknowledge those actions. An overview of precision farming technologies from the October 9th, 2012 GIS Lounge post, "Geospatial Technologies in Precision Agriculture," highlighting the use of satellites to provide an overview of crops and weather which can be utilized by farmers on the ground. 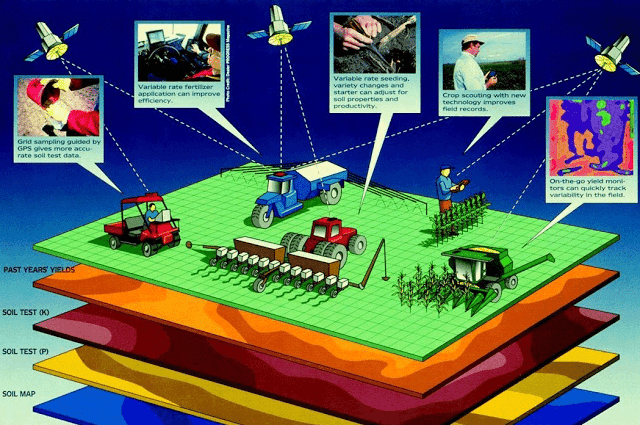 MDA's contribution to farming could include the capabilities of various satellites such as the Canadian RADARSAT-2, the upcoming RADARSAT Constellation Mission (RCM) and the various Earth imaging satellites owned and operated by MDA subsidiary DigitalGlobe. Graphic c/o GIS Lounge. And MDAs recent decision to partner with Calgary, AB based potash and agricultural powerhouse Agrium Inc. along with Olds, AB based Olds College, in order to submit an application for the creation of an agrifood “supercluster” under the recently announced Federal government $950Mln Innovation Supercluster Initiative (ISI), is certainly worth a few kudos. If funded, the "Smart Agri-Food Super Cluster," would be administered from Calgary but would "seek out partners from across the country." As outlined in the August 3rd, 2017 post, "Satellite Canada Applies for Innovation SuperCluster Funds," the MDA team is only one of dozens of organizations vying for Supercluster funds and it's not the only proposal intending to utilize space based assets or even the only proposal with MDA's name attached. But it does have a good sense of the traditional role of Canada's space industry, which has typically been used to solve practical Earth bound problems and help tie the country together. The Agrium, Olds College, MDA proposal is focused on the utilization of Canada's natural resources and, because of this focus, will likely fare reasonably well when the Federal government decides which proposals to support. This will contrast with some of the other proposals which focus on "exploration," lack concrete aims, stress component building to maintain international partnerships but shy away from original innovations/ complete systems and/or focus primarily on "science" to the exclusion of any practical application. For this, MDA and its partners should be congratulated. They've got the business case down cold.